Powerful, mobile ground unit. Critical hit when it attacks from a location six spaces away from where it starts. Knight Cherrystone Kingdom Cherrystone Knights are men and women of great renown. 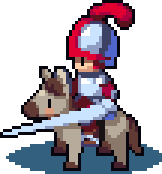 Though they are masters of many weapons and battle techniques, nothing in a Knight's arsenal is as formidable as their faithful steed. Cherrystone rears its horses on the Greensweep, the range of rolling hills that border Cherry Bay. It is said that the mixture of sea air and pollen blown in from the east gives them their great size and speed. Dreadknight Felheim Legion A Dreadknight's steed is a creature of darkness, drawn from across Felheim to its master's side by way of a necrotic blood ritual. The soul of the Dreadknight dominates and absorbs that of its mount until a single consciousness remains. If Dreadknight and stallion are separated for too long, both are driven to a violent madness. Tigerlance Heavensong Empire Tigerlances are creatures of tradition, keepers of old faiths and forgotten secrets in a Heavensong that has long since moved on. Each Tigerlance fashions their lance from dragon bone, believing it to contain the dragon's warrior spirit. The Tigerlance wears the mask of its animal namesake as a mark of the speed, grace and dignity on which they pride themselves. Greenguard Floran Tribes Before Greenfinger Zawan came to power, the fluffalo of the Easterly Glades were little more than a snack to wandering Floran. However, though they may look chubby and stubby, they have proven to be powerful steeds, and as such are now less likely to be seen merely as dinner. The fluffalo's only form of natural defence is to run head-first into things with its eyes close - perfect for a Floran charge. They are effective against most unit types, but the comparatively cheaper Spearman unit can do a surprising amount of damage against Cavalry, and the winged Aeronaut can also become a real obstacle for them. A Cavalry unit scores a Critical Hit when it moves 6 tiles prior to attacking. Note that the ending tile must be 6 tiles away "as a bird flies," which is not always the same as the maximum movement range of the Cavalry, depending on the terrain. For example, if at any point the Cavalry goes through a Forest or around three sides of a Mountain, it will not perform a critical hit that turn. The outer ring is normal "forwards" max-distance attacks, and the inner ring is max-distance attacks "to the side". All attacks on the outer ring will be critical hits, but attacks on the inner ring will only be critical if attacked "from the side", from a ◩ tile. In an actual game, there can only be fewer places where you can crit, because you will be unable to reach some ◩ tiles due to terrain and enemy formations.